Winters come and winters go. Yet I always feel a little sad when my favourite season draws to close. I've been relishing these last few weeks of winter making the most of cosy fires, hearty soups, spicy mulled wine and wearing my favourite coats and scarves. But there's no stopping spring and the changes in the garden clearly signal that the end of winter is nigh. I must admit it is good to be spending much more time in the garden now the days are sunnier and the soil feels warmer. After several years in Tasmania, I know there are plenty of late frosts so I won't get carried away planting much just yet. I'm still enjoying the indoor gardening phase of planning, checking seed stocks and sowing some early spring veg in the green house. 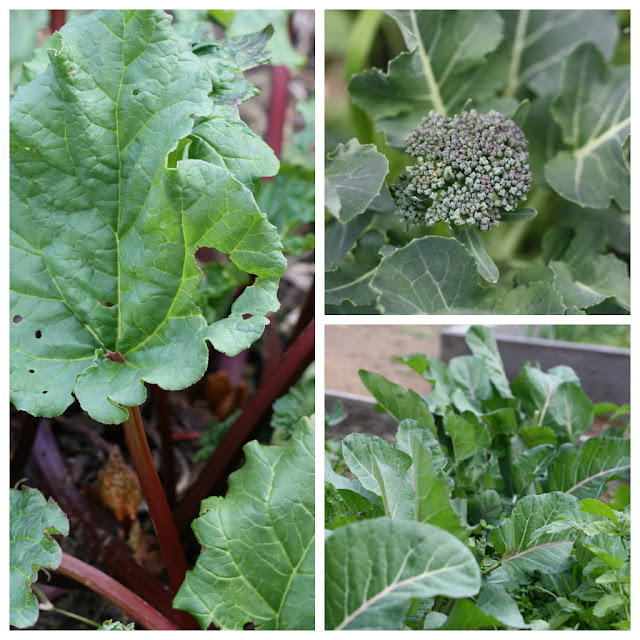 Outside, the veg we planted in autumn, that seemed to spend most of winter sulking, is now going great guns so we have broccoli, parsnips, kale and leafy greens to eat right now. The most obvious sign that spring is on the way, are these longer days. A little more sunshine each day is welcome and allows the peeps a little more play outside. "Don't waste the sunshine" my little one called as he headed out the door to enjoy those extra moments of sunny play today. Spring is on the way. Walking into town the once bare trees are now coated in blossom. Great vegie garden photos. I can't wait to get baking with all the produce. I also love winter time - although you are not supposed to - people seem to think that summer is best? Although my absolute favourite season is Autumn and we are slowly heading that way now-yippee! I promise I wont waste the sunshine if we ever get any. lovely photos - makes me want to get out in the garden right now! I have just come inside for a quick break so that I can refuel and get back out there to tend my garden. It's a glorious day here in Maitland, NSW and the warmth on my back as I work feels wonderful. Wise words from your little one Michelle, lovely photos! What a lovely post! So true! I really need to get out in our veggie garden to get it ready for spring, wonderful fresh veggies is what spring and summer are all about! i'm always sad as winter comes to an end too. I love the end of winter! I love the unexpected warmth when I go to feed the crooks in the morning. And that there's still sunlight streaming into the kitchen at 5. Makes me happy! Beautiful pics. Love the seedlings.